Clone Wars Bloopers: Ep. 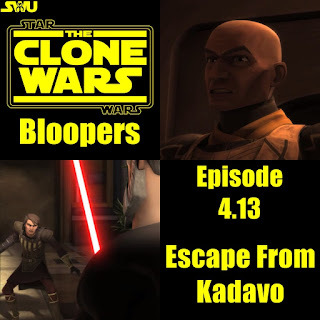 4.13 "Escape From Kadavo"
Escape from Kadavo; A great episode and a goldmine for bloopers! First off, here we go again. Anakin's lightsaber looks as though it's glued to his waist, with no clip. When the shot changes once more, yet again he's very close to the door. But not long after it is lying on the floor, still on one piece. But Atai is standing on the right. When the Queen threatens Dooku, she ignites her shock whip and soon after Dooku begins force choking her. An instant later, without any sound, the shock whip is disengaged and on the floor. But when Dooku begins to electrocute him with Force Lightning there's nothing there. Throughout the the throne room scene on Zygerria, Dooku's Lightsaber is hanging upside down on his belt. It changes back a shortly after. But when they run up to the door the flaming wreckage is on the right. When Plo Koon and Wolfpack first arrive, there are two Z-79 Headhunters that accompany Plo and the gunships as they leave the hanger. But when it cuts to Plo, and then back again there are three Headhunters. Next up, when Anakin takes control of one of the cannons and destroys the others with it, he stops short of blasting the last cannon and tells Plo that it's "All clear." And when Anakin, Obi-Wan and Rex escape on a gunship, Artoo is nowhere to be seen. It's not until the very end, in the hanger that he finally shows back up. So could he have used his jets to get back to the Star Destroyer? Or did he teleport as we've seen before in TCW. Speaking of the hanger scene, in the first shot Artoo is beside Anakin. When they all stop he rolls out of the frame at left. But right after Governor Roshti says "Padawan Tano, may I have a word? ", Artoo can be seen moving right to left behind Plo and Anakin. Big thanks to Dan, Caleb and Ruari for spotting many of the bloopers seen here! (And thanks to Zac for the Skyrim joke) If I made a faux pas of my own, let me know in the comments. If you enjoyed this edition of CWB please click the share buttons below! In my opinion, this episode wasn't as much of an "Instant classic" as it's predecessor, but it had some very epic moments. For as much stuff as there was in this episode it didn't feel rushed at all. Lots of great action, but as always I could have taken more. Even though Plo Koon is a tad overused in this series I really enjoyed his appearance here. And Wolfpack? Well they're just plain epic! And what was the deal with the Slaves? In the last episode they said there was 50,000 of them, in this one there only seemed to be 20 or so! FAIL! Overall I give it an 8/10.